This Karasev Recipe yields, crispy yet soft in texture, with a spiciness of garlic and pepper. Can adjust the spice level according to individual preferences. Summer time means more traveling and much much more snacks. Planning the traveling is a hectic task including sorting out the destinations, choosing the accommodations, selecting vehicles high…All these hectic headaches could easily turn down to cherishable moments if it accompanied with close to heart snacks. 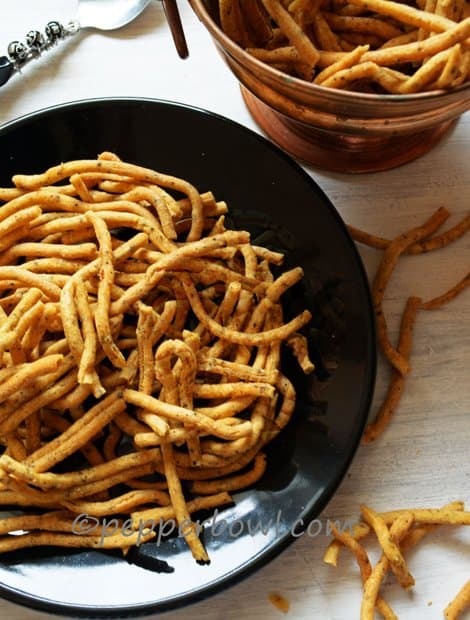 I love this crunchy, garlic and pepper flavored South Indian snack recipe, as it is very versatile. The main purpose is to serve them as tea time snack, but it pairs up beautifully with curd rice. All the South Indians will accept this without any hesitations. 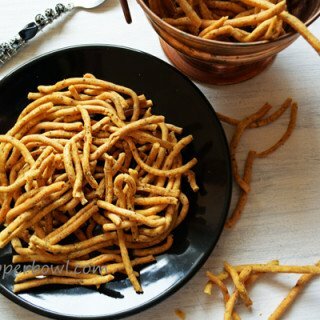 These Karasev is one such snack recipe, soothes everyone’s munching time. These are crunchy, crispy, hugely addictive snacks. You believe me, once you pick and taste the first one, you cannot keep your hand away from it. Making this recipe is much easier. The crispiness is depended on the consistency of the dough. So, provide your little attention towards the dough, it should be pliable and soft, and that’s it, you are done. Go ahead and start to enjoy this karasev as your companion in your travelings. 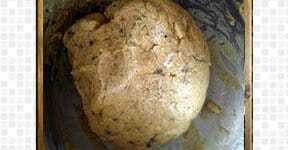 Do not miss other interesting recipes like Easy Badhusha Recipe, Motichur Laddoo Recipe. Step 1. 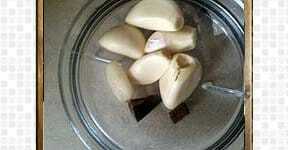 Peel garlic and add asafoetida. I went with the solid version of asafoetida, as I feel it is more flavorful. 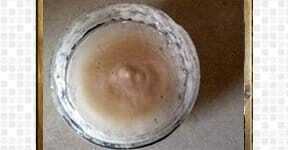 Powder version of asafoetida can also be replaced in this recipe. Step 2. Make a smooth paste by grinding them in the mixer grinder. Step 3. 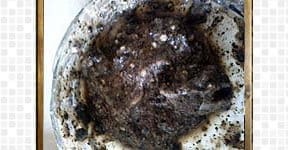 In the same mixer grinder container, add black pepper and grind it coarsely. Keep them aside. Step 4. 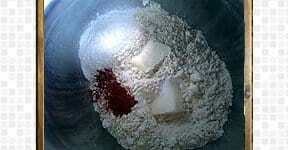 In the mixing container, add Bengal gram flour followed butter, chili powder, and salt. Mixing them well so that butter combines every bit and portion of the flour. Step 5. Then add kept aside ground pepper-garlic mixture. 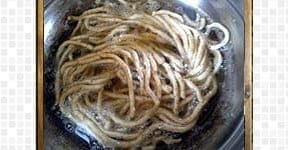 Gently combine them to the flour. Step 6. Sprinkle little water at a time and make smooth pliable dough like in the picture. Step 7. Keep the ‘murukku/chakli press’ ready. Heat oil in the frying pan. Fill the press with the dough. Press it gently over the hot oil. Watch out your hands, as it is sizzling hot oil. Step 8. When the sizzling sound reduces a little using the ladle flip it. In medium flame, allow them to get fried. Once it turns golden brown remove it from the fire. Transfer it to the kitchen towel. Step 9. Once the karasev reaches the room temperature. Gently break them into large pieces like in the picture. And store it in the air tight container. 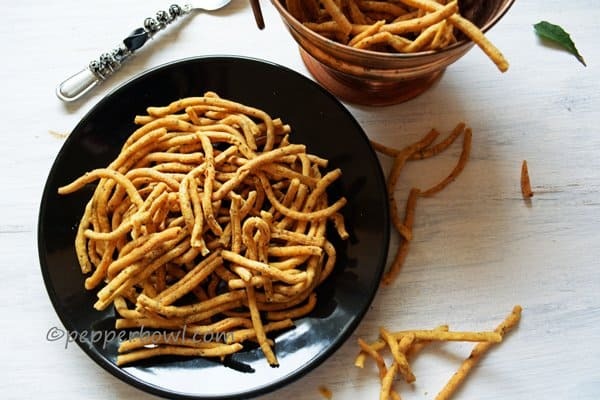 Karasev Recipe yields, crispy yet soft in texture, with a spiciness of garlic and pepper. Can adjust the spice level according to individual preferences. Step 7. Keep the 'murukku/chakli press' ready. Heat oil in the frying pan. Fill the press with the dough. Press it gently over the hot oil. Watch out your hands, as it is sizzling hot oil. 1. As I told earlier, this munching snack can also be served as side dish for the curd rice. 1. I Love karasev to be more spicy and flavorful, you can also reduce the garlic and pepper quantity if you wish. 2. Originally it is pressed in the eyelets of the ladle, to simplify the process I have used ‘Murukku Press’. Would love to munch some, they are dangerously addictive.